Here you’ll learn to create the libations you love from the best barkeeps in the business. Whether you’re an amateur when it comes to alcohol, or a master mixologist, we’ve got something to suit every taste and everything we do is top shelf. So come on, belly up! episode 73 :: Where’s Brooklyn At? Once all ingredients are ice-cold, pour heavy cream, into a tall glass. Then down the center, pour 1/2 the seltzer water. Add chocolate syrup into the hole in the cream created by the seltzer, followed by the rye. Finally, top with the remaining seltzer, allowing the cream to rise. Serve with spoon and plate. Once all ingredients are ice-cold, pour heavy cream, into a tall glass. Then down the center, pour 1/2 the seltzer water. Add chocolate syrup into the hole in the cream created by the seltzer. Finally, top with the remaining seltzer, allowing the cream to rise. Serve with spoon and plate. In the shaker tin, add all ingredients. Top and dry shake until frothy. Open shaker and fill 3/4 with ice. Again, top and vigorously shake until exterior is icy. Double-strain into a chilled coupe glass and dash your favorites across the top. Place tea bag into 2 oz of whiskey and allow to steep according to package. In a stirring glass, add all ingredients, fill ¾ with ice and stir for 30 rotations. Strain in a chilled cocktail glass. Express orange rind quarter round over the glass and discard. In a pot over medium heat, combine water and sugar and bring to 195 degrees. Remove from heat, add the scraped vanilla bean and pod. Cover and allow to rest at room temperature. Strain into an air-tight glass container. Will keep for up to 3 months, if refrigerated. In a shaker tin, add all the ingredients, top and shake vigorously. Double-strain into a chilled coupe glass and garnish with a pinch of dried flowers. Pro tip: two flakes of fleur de sel salt would make it savory. In a pot over medium heat, warm all ingredients until cacao pellets are melted. Allow to cool to room temperature. Makes 3 cocktails. In a tall glass, add Campari. Fill with ice, add the half of ale. Gently stir gently and finish pouring the rest for a frothy head. Garnish with an orange wheel and serve with eco-friendly straw. *You can substitute with your favorite fruity sour beers. In a shaker tin, add tequila, lime juice, sour watermelon water and cinnamon simple syrup. Fill 3/4 of ice, top and shake vigorously. In a salt and crushed flower rimmed rocks glass, double-strain over fresh ice. Garnish with lime and crushed dry flower salt. Allow a watermelon to become over ripened. Remove the rind and juice the flesh. To balance the sourness, add one pinch of citric acid to one quart of juice. Keep refrigerated in an air-tight container. In a pot, combine all ingredients. Over medium heat, cook until sugar is dissolved. Remove from heat, allow to cool and strain into an air-tight container. Keep refrigerated. In a stirring glass, add rye, lacto-raspberry syrup and bitters. Fill with ice, stir for 30 rotations and strain over fresh ice into a rocks glass. Express the orange peel across the rim and discard. Add 2 ice cubes to glass. Add Campari, half of “fluffy” OJ and stir well to combine. Add 1 more ice cube and fill remainder of glass with OJ. Garnish with an orange wedge resting on rim. Peel by hand 2 naval oranges, leaving behind the pith (whites). Pass through electric high-speed juicer. If you don’t have one, hand-squeeze the oranges into a common kitchen blender and set on high or whip until desired froth is reached. Remember, if whipped too long, the juice will begin to breakdown the froth and become flat. In a rock glass, muddle 1 lime and orange wheel. Add vodka, wild berry syrup, fill ¾ with crushed ice and stir. Top with more crushed to form a cone shape and garnish with berries or lime wheel. In a shaker tin, squeeze the kumquats. After pressing, add the expressed rinds, gin, agave and ginger. Fill with ice, top and shake vigorously. Double-strain into a chilled cocktail glass and garnish with a fresh kumquat. In a shaker tin, add all ingredients, fill with ice and shake vigorously. Double-strain into a rocks glass and over fresh ice. Garnish with lime wheel. In a shaker, add all the ingredients, fill with ice and shake vigorously. Strain over fresh ice into a salt-rimmed rocks glass. Everything, plus 2 oz of your favorite mezcal. In a blender, combine all ingredients. Add ice and blend on frappe setting. Pour into a tall glass and garnish with lime wheel. In a stirring glass, add rum and bitters. Fill with ice, stir for 30 rotations and strain into rocks glass over the cotton candy. Garnish with orange peel. In a double rocks glass, add whiskey, lemon juice and simple syrup. Fill with ice, top with beer and gently stir. No straw! No garnish! Simply enjoy! In a shaker, add all ingredients, fill with ice, top and moderately shake. Serve in your favorite tiki cup or highball glass. Garnish with your most festive tiki holiday tchotchkes. In a shaker, add all ingredients, fill with ice, top and moderately shake. Serve in your favorite tiki cup or highball glass. Garnish with your most festive holiday tchotchkes. These cocktails are perfect for a party. Simply multiple by ingredients by the number of guests and flash whip all ingredients in your blender. Serve over fresh ice. In a stirring glass, add all ingredients. Fill with ice and stir for 30 rotations. Strain over a fresh large ice cube in a rocks glass. Express orange peel across the top. In a shaker, combine all ingredients, fill with ice, top and shake vigorously. Strain over pellet ice and garnish with your most festive holiday tchotchkes. In the bottom shaker tin, add gin, lemon juice, black raspberry syrup and egg white. Top and dry shake, until frothy. Open shaker, fill with ice, top and shake vigorously. Double strain into a chilled coupe. In a stirring glass, add all the ingredients, fill with ice and stir for 30 rotation. Stain into cocktail glass. No garnish required. In a shaker, add gin, ginger-mint syrup and lemon juice. Fill with ice, top and shake vigorously. Strain into chilled coupe glass and top with lavender kombucha. Garnish with mint or lavender. In a shaker, add rum, cranberry-sage simple syrup, lemon and pineapple juices. Fill with ice, top and shake vigorously. Double strain into a chilled coupe glass and top with a champagne. Finish with a few dashes of bitters. In a punch bowl, combine all the ingredients. Garnish with herbs and zested orange peels and serve over ice. In a shaker, add all the ingredients, fill with ice, top and shake vigorously. Double strain into a chilled coupe glass and top with a champagne. Finish with one cherry in the bottom of the glass. In a wine glass ¾ filled with ice, add Dubonnet Rouge and Alvear Montilla Fino, top with champagne or soda water and finish with a twist of lime. In a shaker, muddle pineapple and mint. Add rum, lime juice, ginger syrup and coconut milk. Fill 3/4 full ice, top and shake vigorously. Double strain over fresh ice, top with dehydrated pineapple or lime wheel. In a shaker, muddle melon and strawberry. Add the rest of the ingredients, fill with ice, top and vigorously shake. Double strain into a wine glass, add ice and garnish with strawberry slices. Add all the ingredients to an air-tight glass container and gently shake. Keep container at room temperature for 3 days and shake daily. On the third day, strain and refrigerate. In a shaker, combine all ingredients. Top and dry shake for 10 seconds. Open, fill 3/4 with ice, cover and shake until frothy. Double-strain into chilled coup glass and top with 1-2 dashes of TABASCO 150th Anniversary Diamond Reserve Red Sauce (depends on taste). Using an orange, rim an up glass with equal parts white and raw sugar. Set aside. In a shaker, add all the ingredients. Fill 3/4 full of ice, top and vigorously shake. Double strain into your rimmed glass and garnish with an lemon peel. In a pot, combine all ingredients. Over medium heat, cook until sugar is dissolved. Remove from heat, allow to cool and strain into an air-tight container. Will keep for up to 3 months, if refrigerated. Steep one tea bag in 2.5 ounces of room temperature gin for 30 minutes. Chill a coupe or martini glass. Once chilled, discard ice and rub the interior of the glass with a basil leaf. In a stirring glass, add tea-steeped gin and fill 3/4 with ice. Stir for 30 rotations and strain into the chilled glass. Atomized a lemon peel over the top and discard. Garnish with basil leaf. In a shaker, combine whiskey, lemon juice, beet-strawberry juice and strawberry basil Elixir. Fill 3/4 full of ice, top and vigorously shake. In a Collins glass, strain over fresh ice and top with a splash of brut champagne. With a spoon, gently incorporated and garnish with a lemon wheel or strawberry, whichever you prefer. Put in a glass container, combine all ingredients and stir. Allow to sit in the sun for about 8-12 hours and strain into an air-tight container. Will keep for up to 3 months, if refrigerated. In a shaker, combine Laphroaig, syrup, and lemon juice. Fill with ice, top and shake vigorously. Double strain over fresh ice in a highball glass. Top with soda water, gently stir and garnish with a lemon wheel. In a pot over a medium heat, combine all the ingredients. Bring to a boil and then turn off the heat and allow to stand covered for 1 hour. Strain through a fine mesh strainer into an air-tight container. Will keep for up to 3 months, if refrigerated. In a shaker, add tomato juice, lemon juice, horseradish, Tabasco and spices. Add ice, shake and strain into shooter glass. Add oyster and its liquid, slurp and enjoy! In a shaker tin, combine syrup, lime and tea. Fill with ice, top, vigorously shake and strain into a Collins glass. Fill with ice and top with soda water. Gently stir and garnish with fresh mint. In a highball glass, add Pimms No.1 and fill with ice. Add cucumber slice and top with ginger ale. For a nice variation, add a strawberry slice or two. In a stirring glass, add all ingredients and fill ¾ with ice. Stir for 30 rotations, strain over fresh ice into a rocks glass. Express and garnish with an orange coin. In a tall glass, add pisco and skinless lime juice. Fill with ice and top with spicy ginger ale and 3 dashes of bitters. Gently rotate for one stir and garnish with lime wheel. *Remove rind from a fresh lime and squeeze for 1 oz of juice. In a tall glass, add lime juice and pisco. Fill with ice and top with ginger ale and a dash of bitters. Gently rotate for one stir and garnish with lime wheel. EPISODE 45 :: Schuler or Shouldn’t I? In the top of a shaker tin, add one egg white, lime juice, orange juice, cayenne powder and pineapple cardamom syrup. Top and dry shake until frothy. Open shaker, add pisco and fill with ice. Again, top and vigorously shake until exterior is icy. Double-strain into a chilled coupe glass and add 1 dash of 150 Anniversary Tabasco. In the top of a shaker tin, add one egg white, lime juice and simple syrup. Top and dry shake until frothy. Open shaker, add piscos and fill with ice. Again, top and vigorously shake until exterior is icy. Double-strain into a chilled coupe glass and add 1 dash of Angostura bitter. Listen to the episode!Listen to the episode! In a shaker tin, add all ingredients and shake vigorously. Double-strain into a tall glass over fresh ice. Now take on the day! In a stirring glass, add all ingredients and fill with ice. Stir for 30 rotations and strain into a rocks glass over fresh ice. Zest lemon peel over top and garnish with verbena leaf. In a mason jar, muddle black raspberries (set aside a few for garnishment) and lemon. Add vermouth, fill with crushed ice and top with Rosè. Drizzle with blueberry and raspberry syrups and garnish with fresh berries. In a tall glass, add white rum, pineapple-cardamom syrup and lemon juice. Fill with crushed ice, add 3 dashes Angostura and then top with sparkling coconut water. Garnish with an orange slice and enjoy! In a shaker tin, add gin, lemon juice and black raspberry syrup. Fill with ice, top and shake vigorously. Strain into rocks glass, fill with crushed ice and drizzle with Creme de Mure. Grill the watermelon: Cut thick watermelon slices and place on a hot grill and allow to char (5-7 minutes per side). Blend enough watermelon for 1 qt of juice then add 2 teaspoons of kosher salt. Reserve enough watermelon to garnish the glass. To create sweetened lemon juice, add 4 oz fresh lemon juice to 12 oz simple syrup. To smoke the glass, use a butane torch, flame a piece of cedar until it begins to smoke. Place coupe glass up-side down over smoked area and allow to sit while you prepare the cocktail. In a shaker tin, add gin and juices. Fill with ice, top and shake vigorously until cold. Rim smoked coupe glass with black lava salt. Double-strain cocktail into glass and garnish with a piece of grilled watermelon. In a Collin glass, add gin, Aperol and grapefruit juice. Fill with ice and gently swizzle. Top with soda water and garnish with mint. *To make mint syrup, place equal parts water and sugar in a pot, bring to a boil. Reduce the heat and simmer for 10 minutes. Remove from heat and steep mint for 10 minutes. Strain while hot, and reserve syrup. Keeps refrigerated for up to 3 months. In a red wine glass, add gin and club soda. Squeeze lime half and then add the expressed lime to the glass. Fill with ice and gently swizzle. Add infused gin, lime juice and sage in a shaker. Fill with ice, top and shake vigorously. In a Collins glass, double-strain over ice and top with equal parts club soda and cava. Garnish lime wheel. *Place one kiwi in boiling water for one minute. Remove from water, peel and then gently muddle, just enough to mash the fruit but not the seeds. Add mash, toasted cardamom pod and 6 oz of gin to an air-tight glass container. Seal and shake vigorously. Refrigerate for four days, shaking once daily. Strain infused gin before adding it to your cocktail. In a shaker, add all ingredients except sparkling wine. Fill with ice and shake vigorously. Double strain into flute glass top with sparkling wine. In a punch bowl, combine all ingredients leaving the sparkling wine to last. Gently stir. Garnish with thinly sliced grapefruit wheels, a handful of pink peppercorns, and bright, edible flowers. A frozen ice mold with these ingredients contained within can be made in bundt cake mold to encourage chilling while minimizing dilution. Serve into punch glasses and enjoy. In a shaker tin*, add juices, 4-6 raspberries and 1 sprig of rosemary. Fill with ice, top and shake. Double-strain over fresh ice into a tall glass and garnish with two whole raspberries and sprig of rosemary. *To make the mocktail into a cocktail, add 2 oz of your favorite premium gin or vodka. In a blender, combine all ingredients and blend until smooth. This will be the base to create the two recipes below. In a margarita glass, place 6 grapefruit segments. Fill with your frozen pisco sour base and top with 3 dashes of angostura. Garnish with grapefruit peel and blood-orange wheel. 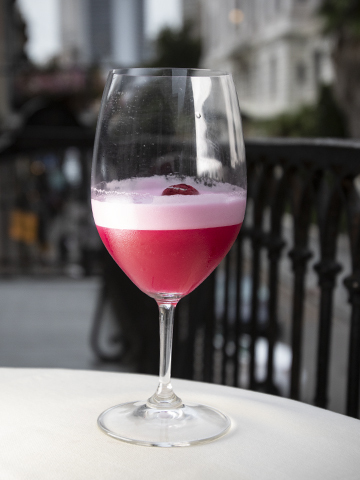 In a Collins glass, add fresh pressed watermelon and fill with frozen pisco sour base. Through a colander, sprinkle matcha powder on top and garnish with frozen watermelon slice. In a shaker, gently muddle oregano, mint, strawberries and raspberries. Add lime juice, pineapple syrup and mezcal. Fill with ice, top and vigorously shake. Double-strain into coupe glass filled with crushed ice formed into a cone shape. Top with Maui Brewing Co. Pineapple Mana Wheat Beer and garnish with sliced dried mango and mint. In a rocks glass, squeeze lime half for 1oz of juice and then add the expressed lime to the glass. Add mint and raspberry syrup and muddle. Add rum, fill with crushed ice and top with either champagne or pilsner beer. Stir gently, garnish with mint sprig and serve with a paper or metal straw. Step 1: Cut honeydew melon in half. Clean the seeds and scrape 2 oz of flesh from the melon to use to make the cocktail. Chill the cleaned melon “bowl’ in the freezer for 10 minutes. Step 2: In a shaker, add brandy, passion fruit juice, apricot juice, bitters, scraps of honeydew and fill with ice. Top and shake vigorously until sides of shaker are icy. Set aside. Step 3: Remove melon “bowl” from freezer and fill with crushed ice to create a cone shape. Step4: Double strain cocktail overtop of the crushed ice and drizzle hibiscus syrup. Garnish with edible orchids and mint. PS. This can also be served this in a glass of your choice. Steep tea according to package and set aside. In a shaker, add gin, syrup, lemon and peach juices. Fill with ice, top and shake vigorously. Strain into tall glass, add 1-2 dashes of bitters and top with a splash of club soda. Do not stir. Simply garnish with mint or edible flower and enjoy. *To make rooibos tea syrup, place 8 oz of water and 8 oz of sugar in a pot and bring to boil. Reduce heat and simmer for 10 minutes. Remove from heat and add tea bag. Allow tea to steep for 8-10 minutes. Cool and strain into an air-tight container. Keeps refrigerated for up to 3 months. Allow 8-12 minutes to prep this drink. In a julep cup, add whiskey and tea bag. Steep for 6-8 minutes. Discard tea bag and add pineapple-cardamon syrup and fresh ginger juice. Fill halfway with crushed ice and stir. Then fill with crushed ice and garnish with sprig of mint. In a shaker, combine moonshine, hibiscus syrup and grapefruit segments. Add ice, shake and double-strain into a coupe glass. Top with champagne and edible flower. In a wine goblet, add wine and ginger syrup. Fill with ice, top with fruit and gently stir. Finish with a splash of soda water and sprig of mint. In a shaker, combine Sipsmith VJOP Gin, lemon juice and Bloody Mary mix. Fill 3/4 with ice, cover, shake and strain into a tall glass over fresh ice. For a Gina-style garnishment, place 2 oz of ahi poke* on a bed of butter or leaf lettuce. Place on top of drink and finish with an olive and celery stalk. *Available at most local fish stands. Our go-to in DC is The District Fishwife. In a shaker, combine Sipsmith London Dry Gin, lemon juice and Bloody Mary mix. Fill 3/4 with ice, cover, shake and strain into a tall glass over fresh ice. In a stirring glass, pour 101 rye whiskey. Add tea bag and allow to steep for 8 minutes. Discard tea bag and add Campari and sweet vermouth to the stirring glass. Fill with ice and stir for 30 rotations. Strain cocktail into a rocks glass, atomized orange peel over top and add to drink. Allow 8-12 minutes prep to prep this drink. Chill a coup glass by filling with ice and set aside. In a stirring glass, pour Knob Creek Rye. Add tea bag and allow to steep for 8 minutes. Discard tea bag and add Campari, vermouth and blood orange syrup into the stirring glass. Fill ¾ with ice and stir for 30 rotations. Discard ice from coup glass. Strain cocktail into the chilled glass and express blood orange peel, then discard garnish. In a copper mug, combine all ingredients, stir, fill with crushed ice and garnish with sprig of mint. Fill a rocks glass with ice to chill. Set aside. In a stirring glass, combine rye whiskey, apple honey syrup, and bitters. Fill with ice and stir for 30 rotations. Set aside. Empty ice from rocks glass. Add the absinthe and swirl to coat the sides of the chilled glass and discard the remainder. Strain the cocktail into the glass and spritz with a quarter peel of lemon. In a pot over medium heat, warm the apple juice and cinnamon stick. Once warm, slowly add the honey, DO NOT BOIL. Once honey is dissolved, remove from heat and allow to cool. Strain into an air-tight container and keep refrigerated. In a stirring glass, combine blood orange syrup, mezcal, salt and bitters. Add ice, stir for 30 rotations and strain over fresh ice in rocks glass. Express orange peel along rim of glass and drop into glass. Combine all the ingredients in a shaker tin, top with ice and shake. Strain over crushed ice and garnish with a three-flag salute*. *Slice of orange, lemon and lime layered together. Episode 21 :: Drummers, Bartenders, Experts...Oh, my! In a soda siphon, add lemon-lavender syrup and champagne. Double charge with CO2 to insure higher carbonation. In a high ball glass, pour Suntory Whisky Toki™ and fill with ice. Top with lemon-lavender champagne soda and garnish with lemon wheel. In shaker tin, combine all ingredients. Shake vigorously and double-strain into a chilled coupe glass. Garnish with a lime wheel. Combine all ingredients in a mixing glass. Fill with ice and stir for 30-40 rotations and strain into a chilled coupe glass. Express and garnish with one orange peel. Episode 19 :: Lips Say What? In a shaker tin, muddle blackberries. Squeeze lime and add gin, yuzu bitters and lemon syrup. Fill ¾ with ice, shake and then strain into a coup or flute glass. Top with dry champagne. Fill a rocks glass with ice, add absinthe and set aside. In a stirring glass, add rye whiskey, lemon simple syrup and bitters. Fill ¾ with ice and then stir for 30 rotations. Discard ice and absinthe and strain cocktail into the rocks glass. Atomized and then drop lemon peel into glass! In a shaker tin, combine bourbon, mint syrup, lemon juice and Savvy Bourbon Honey Mustard Sauce. Fill 3/4 of the way with ice, top and shake until frothy. Strain into pint glass, fill with fresh ice and top with lager beer. Garnish with lemon wheel. In a shaker tin, combine all ingredients. Fill ¾ with ice, shake and double strain into a chilled coupe glass. No need to garnish, just sip and enjoy! In a shaker tin, combine Bacardi, Oleo Sacchaarum, grapefruit juice, bitters and 3 of the shiso leaves, add ice and shake until frothy, double strain into a chilled coupe glass and garnish with fresh shiso leaf. In a tumbler, fill with shaved ice, add tequila, strawberry syrup, coconut cream. Squeeze half of lime and serve with long spoon and wide straw. *If you can’t get Donna’s special snoball syrups, we recommend creating your own. Find some helpful tips here. In a glass, combine all ingredients, fill with ice and gently stir. Garnish with orange peel. In a shaker tin, combine moonshine, cranberry jelly, lime juice and bitters. Separate one egg white and add to the rest of the ingredients. Secure tin and vigorously shake. In a coup glass, pour drink and garnish with rosemary. *To infuse, place 3 large fresh sprigs of rosemary into a bottle of 750mL Belle Isle Moonshine. Allow to infuse for no more than 24 hours. In a champagne flute, combine B&B, lemon juice and honey syrup. Top with champagne and enjoy! To make a punch, combine 2 bottles of bubbles, 7 oz B & B, 7 oz lemon juice, 5 oz honey cinnamon syrup in a punch bowl. Garnish with lemon wheels. *To make cinnamon honey syrup, bring 1 cup water, 1 cup of honey and 2 cinnamon sticks to a gentle boil. Remove from heat and once cool, discard cinnamon sticks. Reserve the syrup in an air-tight container. Keeps refrigerated for up to 3 months. In a shaker tin, combine all ingredients, squeeze .5 lemon and add ice. Shake and strain into an ice-filled rocks glass. Garnish with a lemon wheel. In a pot, combine spices, cider, and sugar and bring to boil over medium-high heat. Remove from heat, add tea bags and steep for 7 minutes. Remove tea bags, strain and allow to cool. To serve hot, simply combine warm cider with all other ingredients and serve it in your favorite mug. In a champagne flute, pour gin, Aperol and grapefruit juice. Top with bubbles and enjoy! To make a punch, combine 7 oz gin, 7 oz aperol, 28 oz grapefruit juice, 7 oz simple syrup, 1 bottle of bubbles (champagne or dry prosecco) and let the party begin. *To make simple syrup, place equal parts water and sugar in a pot, bring to a boil. Reduce the heat and simmer for 10 minutes. Remove from heat, strain while hot, and reserve syrup. Keeps refrigerated for up to 3 months. In a shaker, add rum, syrup, lime juice, bitters and fill with ice. Shake and strain into a Collins glass. Add ice and top with ginger beer. Garnish with orange peel. Multiply ingredients equally to create an easy punch or change it up by replacing rum with premium vodka or gin. In a pot, combine water, sugar and cranberries. Over medium heat, bring to a gentle boil, reduce heat and let simmer for 15 minutes or until cranberries begin to break down. Reduce heat, add cinnamon, cloves and allspice and simmer for 5 minutes. Strain, cool and reserve the syrup in an air-tight container. Keeps refrigerated for up to 3 months. In a siphon, combine fassionola syrup, grapefruit juice and carbonated water. Double charge, shake and release into a Collins glass filled ice. Garnish with mint and basil. Omit gin for a refreshing non-alcoholic option. In a shaker tin, combine all ingredients. Fill 3/4 with ice, cap and shake vigorously. Double strain into a chilled coupe glass. No need to garnish, but who doesn’t love getting flowers—especially the editable kind. In a pot, combine sugar and water. Over medium heat, bring to a gentle boil (mixture should appear clear). Add verbena leaves, stir for 2 minutes and then remove from heat. Cover pot and let steep for 30 minutes. Strain, cool and reserve the syrup in an air-tight container. Keeps refrigerated for up to 3 months. In a soda siphon, combine all ingredients. Charge with CO2, assemble siphon and tightly secure top. Shake siphon. Serve over ice in a Collins glass. Recipe makes one drink. For a full siphon, multiply recipe by five. Garnish with apple slice and sprig of mint for color! In a shaker tin, combine all ingredients, add ice, shake and double-strain in a chilled coupe glass rimmed with spinella citrus salt. *Spinella can be found in most natural/specialty grocery stores or juice shops. In a bowl, mix all ingredients until fully incorporated. Keep in an air-tight container for up to one month. Do not refrigerate. In a pot, combine all ingredients and bring to boil over medium-high heat. Once sugar is fully dissolved, remove from heat and allow to cool. Double strain into an air-tight glass container and keep refrigerated for up to 3 months. In a soda glass, add syrup and grapefruit juice. Fill with crushed ice and top with champagne or sparkling water. Give a gently stir and spritz with bergamot and grapefruit spray. Garnish with edible flowers and fresh or dried fruit for an "offering" the spirits will love. In a shaker tin, combine all ingredients and fill 3/4 full of ice. Shake until the exterior of the tin is icy and then double strain into a chilled coupe glass. Garnish with a fresh mint sprig. In a collin's glass, add Hendricks gin, juice and simple syrup. Fill with ice, stir and top with sparkling. Stir gently and garnish with fresh herbs of your choice. In a wine glass, combine aperol, grapefruit juice, shiso and verbena. Fill with ice and top with rose champagne. Stir gently and garnish with marigold and shiso leaf. Combine all ingredients in an ISI soda siphon. Secure tightly, charge with CO2 cartridge and shake siphon. Fill a Collins glass with ice and spray drink into glass. Garnish with sprig of mint and grapefruit peel. In a stirring glass combine Makers Mark bourbon, raspberry syrup* and Angostura bitters. Fill with ice and stir for 30 rotations. Strain into a rocks glass filled with fresh ice. Top with a splash of 3-Stars Brewing Peppercorn Saison and garnish with lemon twist. In a pot, combine all ingredients and bring to a boil. Reduce and let simmer for 10 minutes. Remove from heat and while hot, strain into an air-tight container. Will keep for up to 3 months, if refrigerated.